Q. It seemed to me the moments you were struggling on the court, you had troubles with your forehand. Maybe there was a lack of depth. Q. You had troubles being deep with the forehand. Do you agree? Q. The moments you were struggling on the court were because you had troubles with your forehand. Do you agree? RAFAEL NADAL: I am not agree. No, not today. Q. Another strong win. How do you feel? RAFAEL NADAL: Very happy. I think I played at highest level after long time, for a long time, three hours almost. Since beginning I played a great match. I had a big chance to be 4‑Love in the second. Probably if I was able to make that game, the whole match change and I will have the chance to win a little bit easier than what I did. But at the same time a victory like this helps me more in terms of confidence, in terms of physical, in terms of mentality. The way I played the third after losing disappointing second, it was a great third set in terms of tennis, in terms of physical performance, in terms of mentality. I was doing that very often last couple of years. That's the line. That's the way I have to do it to be back where I want to be. Today I have to say that I played the way that I want to play. I was in the third, yes, because dynamic of the last couple of months have not been perfect. When you lose matches, the confidence sometimes is not there, and you don't catch the points you need to win the match a little bit easier. But the way that I was playing today tennis, if that happens with more victories on my shoulders, I think I will have a good chance to win in straight sets. Q. It was a kind of match you were looking for to get more confidence? RAFAEL NADAL: Every day is a different day. Every day is a chance for me to improve, to be more confident, to find the feelings I need to find to play my best game. I think, without doubt, this tournament have been the best tournament since the beginning for me in terms of concentration, in terms of nerves, general nerves. I didn't play with that nerves that I was playing with in the previous tournaments. I felt in the important points I have been able to play the way that I wanted to play. Is true that I lost that game with 5‑4, but I didn't have mistakes. Probably in that moment I didn't play that deep with my forehand. But, you know, it's an important match for me. Is not easy to play that aggressive in that moment when you were not doing that for a while, no? I lost that game. I accepted. I didn't have mistakes. He played well. He played aggressive. That's it. I could play little bit more aggressive, yes. But I didn't make nothing wrong. I didn't make nothing perfect in that game, but nothing wrong. I accepted that and tried to find, again, the position in the third, playing aggressive game, open the court with the backhand and change the direction with the forehand. Is a very important victory for me. Today is a very important victory for me for the confidence for the next couple of months. Q. Tomorrow you have to play Djokovic. Maybe at the beginning of the tournament you were not too confident on your chances. What now? Has something changed after today? Do you know he lost five games in the first, four in the second, three in the third. RAFAEL NADAL: No, tomorrow I am not favorite, that is obvious. When you play a player that is winning everything like he is doing, it is always going to be a very tough match to win, no? He's playing almost perfect. He's doing everything well, winning all the matches with no many problems. So when the things go that well, is difficult to stop a player like Novak. As I say before the tournament, no, is not my fight today. But tomorrow is a good match for me. Is another chance to be on court, to enjoy the match, to find again the feelings that I found today. Then we'll see what happens. I love this court. I love the tournament. I am in semifinals again. That's a very, very, very positive result for me, especially the way that I get to that semifinals. Let's play the match of tomorrow, try my best, fighting for every ball. I hope to be recovered physically because obviously I am not used to play at that level of tennis and that intensity for three hours in a tough match, battle, on clay. I don't know how I will be physically tomorrow. I hope to be ready. If that happens, I am ready, I going to do my best as I do all the time. I know is a big, big challenge, but I don't have nothing to lose tomorrow. Is a good tournament already for me. I think I did the thing that I wanted to do here. I am sure that will help me for Barcelona, for Madrid, for the next few weeks. Q. Facing Djokovic in the semifinals here is also a sign that you're back with the best. I would like to know if facing your main rivals ahead of major tournaments is something you like or do you prefer to avoid them before taking them on at the majors? RAFAEL NADAL: I prefer to win. I not stupid. Playing against the best players, the chances to win are less than playing against another players, no? I don't believe the players who say, No, I want to play against the best in the final. They are lying you. Everybody wants to play against the easier opponent possible to have the title at the end. The most important thing is win the tournament. Sometimes at the end of the day matters against who you do it because for personal satisfaction is a little bit better. Depends the opponent. But what stays there is the title for the rest of the story, not against you, not against who you won that title. I prefer to play against an easier opponent than Novak, without any doubt. But I going to play with Novak tomorrow. I don't going to change that. I have to be ready for it. It's a little bit early for me because I was playing little bit not consistent for the last couple of months, but I was consistent here. I don't know if three matches are enough to play that match of tomorrow. Tomorrow we will see. Q. I'm sorry to move to a completely different subject. Martina Hingis will play singles in Fed Cup after 17 years of not playing singles. I would like to know if you think anything about it, what your reaction is to that. RAFAEL NADAL: No, I think Martina, what she did in the story of tennis is very important. She was a big star. Is good to have the big stars around our sport. You know, is something that is great. She's going to play singles, great. But is important to have the past champions, historic champions of our sport, close to our sport, no? That in my opinion is something the golf makes very well. You see in important tournaments always the past champions and the most important players of the history of golf there supporting the tournament. The tournament makes things for the historic players. Is something that in tennis will be good if that happen more often, too, because what makes the sport important are the new things combined with the old things, no? Martina, she's a great champion, and is good to have her on tour, without any doubt. Q. It will be the 43rd time you play against Djokovic tomorrow. At this point is there still something you can change in your game or guess in his game, or do you know everything there is to know? 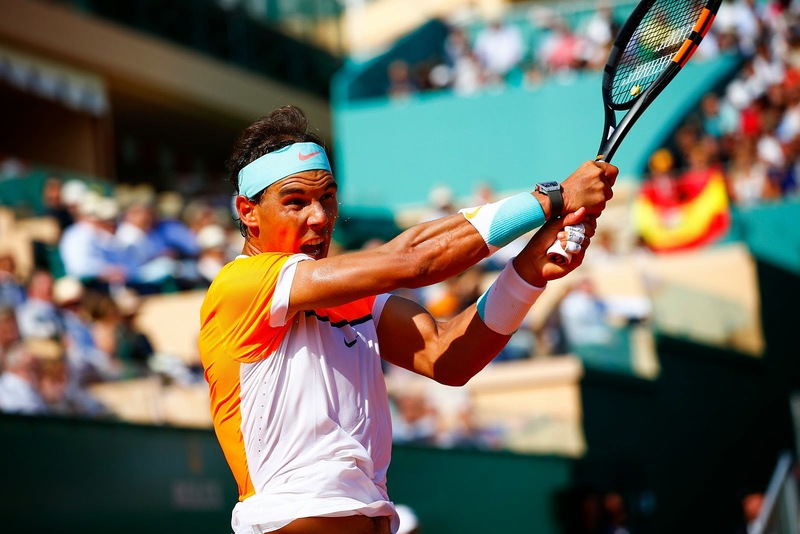 RAFAEL NADAL: As I said hundreds of times, when you play against these kinds of players, when both are on the highest level possible, is just depends on the moment. The player who play better that win. The player who play worst lose. I think is not the day we are at the same level. Is obvious he is in the highest level than me today, of confidence, of tennis, of titles for the last couple of months. Especially after Wimbledon last year that I didn't play. Before that, we were there (equal). I am try my best to be back to that level to have again the comparation [sic] with a player like Novak.